...the X99E-ITX/ac is a surprisingly solid little board that, should you wish, can run an 18-core, 36-thread Xeon without issue. With the X99E-ITX/ac board ASRock has gone out to solve a problem that doesn't exist. 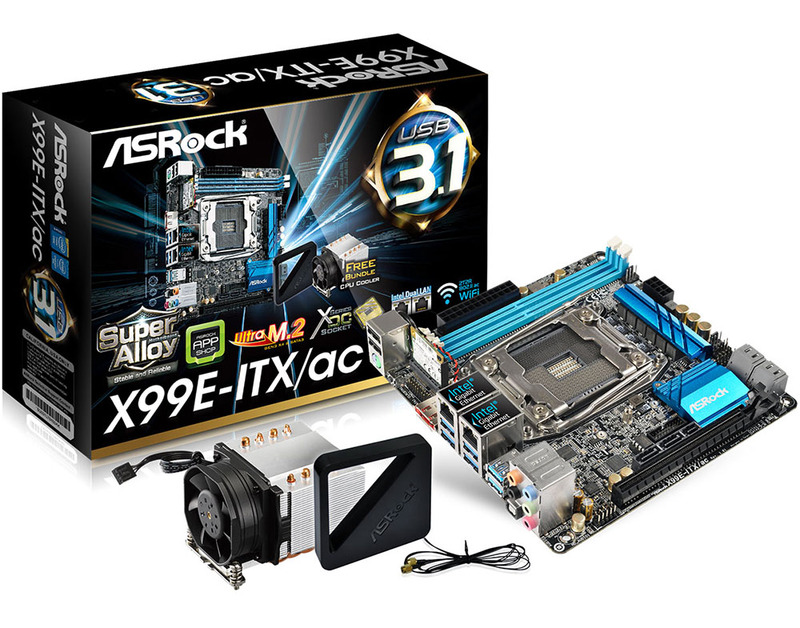 Shoehorning the large, powerful X99 platform into a Mini-ITX form factor isn't high on most motherboard manufacturers' priority lists, but in keeping with recent tradition, the R+D team at ASRock has found a way to do the near-impossible. Barely suffering from a lack of memory bandwidth introduced by having only two DIMM channels, the X99E-ITX/ac is a surprisingly solid little board that, should you wish, can run an 18-core, 36-thread Xeon without issue. M.2, SATA Express, 802.11ac WiFi, and USB 3.1 are all catered for, while the BIOS is solid and fan control decent. Budget permitting, a Mini-ITX system can now house an Intel Core i7-5960X CPU, Titan X GPU, 16GB of RAM and a super-speed M.2 drive along with other ancillary goodness. There are undeniable shortcomings when designing for a tiny form factor, with noise being the biggest issue, but for many of our readership that want power in a small, LAN-friendly package the ASRock X99E-ITX/ac is rather tough to beat. Any chance of an image of the underside of the board? I'm wondering how densely packed the underside is considering how much ASRock have managed to cram on top. I think you unfairly hobbled the CPU and board performance with that heatsink, although it's included, realistically it's no better than the stock HSF, if that, and certainly nowhere in the range of the D15. You should have also tested it with a Corsair H80i or some such, which is about equally matched. I think I saw a video where someone used the mounting hardware for that fan with an H80i without modification. Since the H100i has the same block you could use that too. What stock cooler? i7-5xxx don't have a stock cooler.